Wightlink delays 30 mins, now 50mins tech problems. 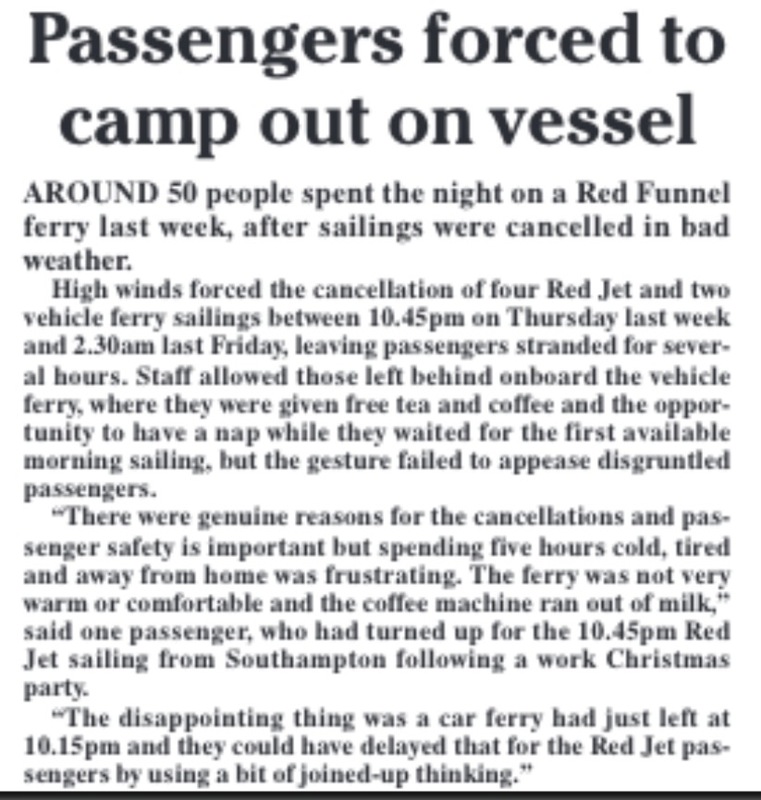 Red funnel ferry 7:15am delayed by 30mins, operational reasons??? Vehicle Ferry delayed by 60 mins due to an earlier police incident. We’re sorry but due to a mechanical problem with the loading ramp at Portsmouth Harbour, additional sailings today and tomorrow morning (Tuesday 1 March) will be operated by a charter service on a revised schedule. Charter sailings will take longer than usual. Solent Cat has a crossing time of around 25 minutes, Wight Scene has a crossing time of around 35 minutes. East Cowes to Southampton at 23:55 cancelled due to essential maintenance. Southampton to East Cowes at 22:30 cancelled due to essential maintenance. Our last vehicle ferry sailing this evening from ECowes will be 2355 due to essential maintenance the next sailing after this will be 0715. Due to dense fog this morning we are experience longer crossing times and some delays. We apologise for any inconvenience. Our Portsmouth – Fishbourne (car ferry service) Some sailings are experiencing delays of upto 15 mins due to one of our vessels operating at reduced speed. Southampton to East Cowes Vehicle Ferry at 16:00 delayed by 25-30 mins due to technical issue. East Cowes to Southampton Vehicle Ferry at 17:30 delayed by 30-40 mins due to an earlier technical issue. We apologise for the inconvenience to your journey. Due to adverse weather conditions our service is currently suspended. Hovertravel wish to apologise for any inconvenience caused. Vehicle Ferry delayed by up to 30 mins due to earlier adverse weather. We apologise for the inconvenience to your journey. 1pm-Vehicle Ferry delayed by 30-40 mins due to earlier adverse weather. We apologise for the inconvenience to your journey. We are getting delays at East Cowes due to ferry traffic cant get into the terminal, all route 4 and 5 will be subject to delays. East Cowes to Southampton Vehicle Ferry at 9:30am on 29th March cancelled due to essential maintenance. Southampton to East Cowes Vehicle Ferry at 8:00am on 29th March cancelled due to essential maintenance. The 06:40am sailing from Portsmouth is cancelled. Our Portsmouth Harbour – Ryde (catamaran service) the 0740 , 0840 , 0940 sailings from Portsmouth Harbour and the 0810 and 0910 sailings from Ryde Pier will be operated by a charter vessel. Our Portsmouth Harbour – Ryde (catamaran service) the 16:40 , 17:40 ,18:45 sailings from Portsmouth Harbour and the 17:10 and 18:10 sailings from Ryde Pier will be operated by a charter vessel , the 19:10 sailing from Ryde Pier tonight has been cancelled. Red Jet delayed by 10 mins due to speed restrictions. We apologise for the inconvenience to your journey. Our service is currently suspend due to adverse weather conditions, we’re sorry for any inconvenience this may have caused you. Our Portsmouth Harbour – Ryde (catamaran service) the 0740 , 0840 , 16:40, 17:40 & 18:45 sailings from Portsmouth Harbour and the 0710 , 0810 , 0910, 17:10 ,18:10 sailings from Ryde Pier will be operated by a charter vessel. Our Portsmouth Harbour – Ryde (catamaran service) The 08:40 ex Portsmouth harbour and 09:10,ex Ryde pier head is cancelled because of thick fog. Red Jet delayed by 15 – 20 mins due to reduced visibility. We apologise for the inconvenience to your journey. Red Jet XX45 from Southampton and XX15 from Cowes delayed by 15 mins due to technical issue. East Cowes to Southampton Vehicle Ferry at 18:30 cancelled due to technical issue. Southampton to East Cowes Vehicle Ferry at 17:00 cancelled due to technical issue. 16-21 April 2016 – there are no sailings at the times marked with † symbol in the tables below. Please accept our apologies for any inconvenience caused by this revised timetable which is due to the unforeseen dry-docking of a vehicle ferry in Falmouth to fix a propeller issue. The normal summer timetable will resume on Friday 22 April 2016. TRAVEL: Red Funnel warn that their car ferry service between East Cowes & Southampton is on a revised timetable this week. 30min to 40min delays on the 6am ferry from Fishbourne to Portsmouth. This is due to a radar not working on one of the vessels last night. Update – 6am ferry cancelled. East Cowes to Southampton Vehicle Ferry at 16:30 delayed by 15 mins due to operational reasons. Southampton to East Cowes Vehicle Ferry at 18:00 delayed by 15 mins due to operational reasons. Vehicle Ferry delayed by 60 mins due to technical issue. We apologise for the inconvenience to your journey. Shuttle service in operation, with arrivals and departures occuring as frequently as possible, but not to our standard timetable. We are operating a shuttle service with arrivals and departures occuring as frequently as possbile, but not to our standard timetable. Unfortunately we are still experiencing technical issues with one of our craft, so we are once again running a shuttle service. 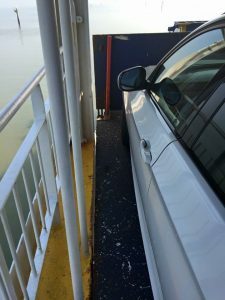 Passengers unable exit vehicle from the correct side…. 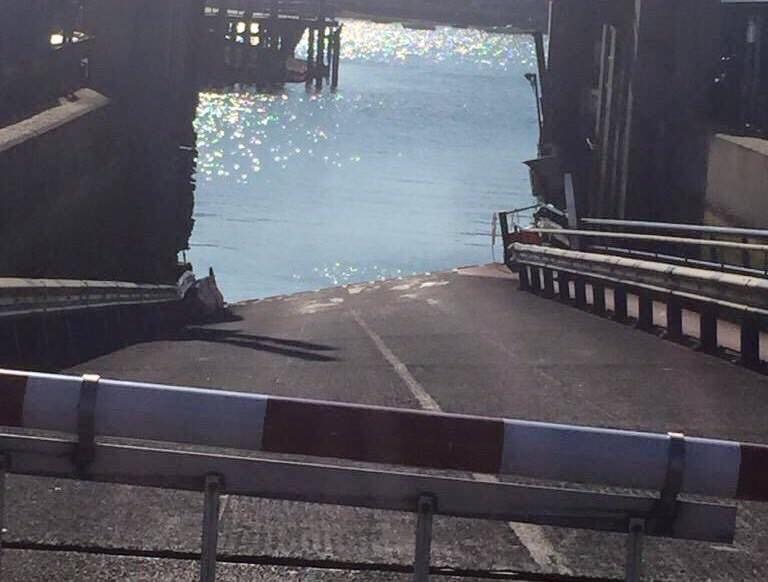 Our Lymington – Yarmouth (car ferry service) The 15:00 sailing from Lymington will not be taking any vehicles because of essential maintenance (foot passengers can still board). Customer with reservations have been rebooked. We are sorry for the inconvenience caused. TRAVEL: Wightlink warn of 20 min delay on Lymington-Yarmough car ferry. Staff sickness. Southampton to East Cowes Vehicle Ferry at 11:00 delayed by 20 – 30 mins due to medical emergency. East Cowes to Southampton Vehicle Ferry at 14:30 delayed by 20 – 30 mins due to operational reasons. Southampton to East Cowes Vehicle Ferry at 13:00 delayed by 20 – 30 mins due to operational reasons. Southampton to East Cowes Vehicle Ferry at 21:00 delayed by 20 mins due to operational reasons. Red Jet delayed by 10 mins due to operational reasons. West Cowes to Southampton Red Jet at 6:45 cancelled due to technical issue. We apologise for the inconvenience caused to your journey. East Cowes to Southampton Vehicle Ferry at 17:30 delayed by 20 – 30 mins due to technical issue. Our Portsmouth Harbour – Ryde (catamaran service) due to a mechanical problem on board Wightryder 2 the 17:40 and 18:45 sailings from Portsmouth Harbour and the 18:10 and 1915 sailings from Ryde are cancelled. Red Jet delayed by 10 mins due to operational reasons. We apologise for the inconvenience to your journey. Red Jet XX45 from Southampton and XX15 from Cowes delayed by 10 mins due to speed restrictions. TRAVEL:Hovertravel have technical probs. Cancelled: From Ryde, 07.30, 08.00, & 08.30. From Southsea, 07.45, 08.15 & 08.45. Red Jet XX45 from Southampton and XX15 from Cowes delayed by 15 mins due to operational reasons. Southampton to East Cowes Vehicle Ferry at 13:00 delayed by 10 mins due to shipping movements. Southampton to East Cowes Vehicle Ferry at 14:00 delayed by 10 mins due to shipping movements. We’re currently dealing with an incident at the Red Funnel terminal in Town Quay, Southampton. At 9am this morning (Wednesday, July 6), Red Funnel staff found a suspicious package in the terminal. They evacuated the terminal and there are disruptions to their ferry services. A cordon is in place and officers are on scene. For information about the ferry services, please contact Red Funnel. West Cowes to Southampton Red Jet at 17:15 cancelled due to technical issue. We apologise for the inconvenience caused to your journey. West Cowes to Southampton Red Jet at 18:15 cancelled due to technical issue. We apologise for the inconvenience caused to your journey. Southampton to West Cowes Red Jet at 17:45 cancelled due to technical issue. We apologise for the inconvenience caused to your journey. TRAVEL: Wightlink have had to cancel the 09.30 car ferry sailing form Portsmouth & the 10.30 sailing from Fishbourne. Technical probs. We have a revised timetable in place on Thursday 21 July 2016 to facilitate essential maintenance work. Affecting the Southampton-East Cowes service only, there will be fifteen departures in each direction instead of the usual nineteen. Red Jet delayed by 10-15 mins due to technical issue. We apologise for the inconvenience to your journey. We will be running an additional service departing West Cowes at 11:30 and Southampton at 1715..
Our Vehicle Ferry service is delayed by 15 mins due to technical issue. We apologise for the inconvenience to your journey. East Cowes to Southampton Vehicle Ferry at 17:30 delayed by 20-30 mins due to technical issue. Our Portsmouth Harbour – Ryde (catamaran service) Is running a hourly service, sailings to depart Portsmouth harbour 15 minutes past the hour and from Ryde Pier head 47 minutes past the hour. West Cowes to Southampton Red Jet at 21:15 cancelled due to technical issue. We apologise for the inconvenience caused to your journey. Southampton to West Cowes Red Jet at 8:45 cancelled due to technical issue. We apologise for the inconvenience caused to your journey. Red Jet running a one boat service departing Cowes at XX45 and Southampton at XX15 due to technical issue. We’re sorry but we’ve had to make some changes to our Portsmouth Harbour – Ryde Pier Head Catamaran timetable on Tuesday, 26 July 2016. This is because we’re carrying out essential maintenance to Wight Ryder I. We will continue to provide a frequent service with Wight Ryder II and have also scheduled a charter vessel ‘Solent Cat’ in place of Wight Ryder I. The Solent Cat has a crossing time of 22 minutes. 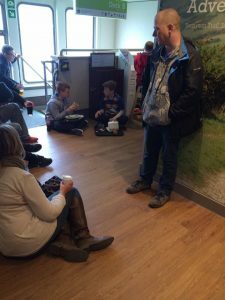 TRAVEL: Wightlink Fastcats. Cancelled: 06.40 from Portsmouth, 19.15 from Ryde. Slower charter vessel replacing some peak time sailings. 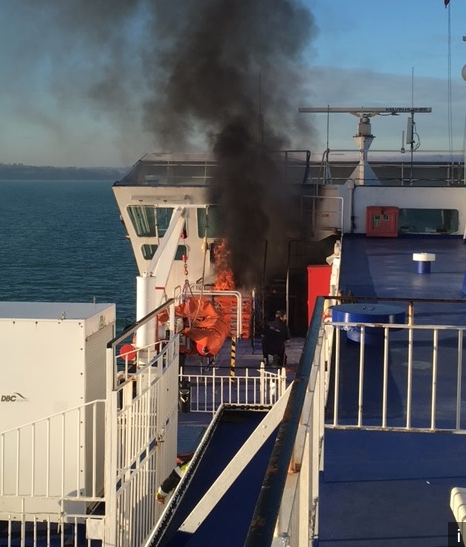 Lack of maintenance causes air condition fire on Wightlink. Red Jet delayed by 15 mins due to technical issue. West Cowes to Southampton Red Jet at 15:15 cancelled due to technical issue. We apologise for the inconvenience caused to your journey. Southampton to East Cowes Vehicle Ferry at 13:00 delayed by 10-20 mins due to shipping movements. Southampton to East Cowes Vehicle Ferry at 16:00 delayed by 20 mins due to shipping movements. The P-F (car ferry) due to technical problems earlier in the day sailings are delayed by 30 minutes. Vehicle Ferry delayed by 20-30 minutes due to operational reasons. Red Jet delayed by 15 mins due to speed restrictions. We apologise for the inconvenience to your journey. Southampton to East Cowes Vehicle Ferry at 20:20 delayed by 10-20 mins due to high traffic volumes. Apologies for any inconvenience. 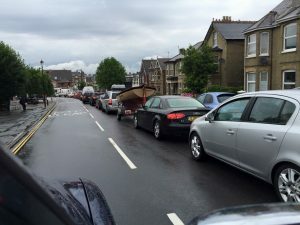 Southampton to East Cowes Vehicle Ferry at 21:00 delayed by 10-20 mins due to high volumes of traffic . Apologies for any inconvenience. Vehicle Ferry delayed by 30-40 mins due to high traffic volumes. We apologise for the inconvenience to your journey. West Cowes to Southampton Red Jet at 18:15 cancelled due to adverse weather. We apologise for the inconvenience caused to your journey. Red Jet delayed by 10 mins due to high passenger numbers. We apologise for the inconvenience to your journey. Our Portsmouth Harbour – Ryde (catamaran service) due to a mechanical problem the 16:40 sailing from Ports Harb and the 17:10 , 19:15 sailings from Ryde Pier are cancelled , the 17:40, 18:45 from Portsmouth and 18:10 from Ryde will be operated by a charter vessel. Due to dredging taking place around Portsmouth Harbour some of our sailings may be affected. We apologise in advance for any inconvenience. The P-F (car ferry) due to speed restrictions in the channel sailings are delayed by 30 minutes. Our Portsmouth – Fishbourne (car ferry service) due to speed restrictions in the channel sailings are delayed by 30 minutes. We are operating to our summer timetable, however, we are currently experiencing a delay of upto 15 minutes. We wish to apologise for any inconvenience caused. Our Vehicle Ferry service is delayed by 15-30 mins. We are working to reduce delays and apologise for the delay to your onward journey. Lack of maintenance on the Wightlink ship caused catastrophic failure. Thursday 8th September bestival weekend! Our Portsmouth – Fishbourne (car ferry service) due to staff illness the 20:30 sailing from Gunwharf and the 21:30 sailing from Fishbourne have been cancelled. Wightlink -Catamaran 6:47am is cancelled from Ryde pier!!!! Southampton to West Cowes Red Jet at 6:15 Cancelled due to operational reasons. We apologise for the inconvenience caused to your journey. 10.30 am RF sailing from E cowes Delayed 20 mins for a bomb scare drill. Southampton to East Cowes Vehicle Ferry at 17:00 cancelled due to technical issue. Apologies for any inconvenience. Our Portsmouth – Fishbourne (car ferry service) The 16:30 has been cancelled due to a mechanical problem. Other services are delayed by 20 minutes. 08:40 P-R and 09:10 R-P Catamaran sailings are cancelled due to high winds. Southampton to West Cowes Red Jet at 18:15 cancelled due to technical issue. We apologise for the inconvenience caused to your journey. West Cowes to Southampton Red Jet at 19:45 cancelled due to technical issue. We apologise for the inconvenience caused to your journey. Southampton to West Cowes Red Jet at 19:15 cancelled due to technical issue. West Cowes to Southampton Red Jet at 7:45 cancelled due to waterjet obstruction. We apologise for the inconvenience caused to your journey. 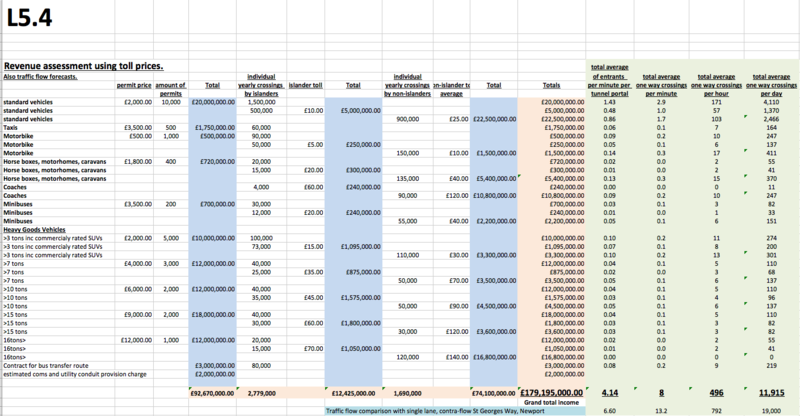 Revised Timetable – Monday 24th October 2016 – Friday 28th October 2016. Any passenger booked on any of the above services are asked to please book on an alternative crossing or be on a priority standby. Rough weather can cause serious problems for the ferries. Red Jet XX45 from Southampton and XX15 from Cowes delayed by 15 mins due to an earlier technical issue. Red Jet XX45 from Southampton and XX15 from Cowes delayed by 10 mins due to earlier technical issue. Service is currently suspended due to technical reasons. East Cowes to Southampton Vehicle Ferry at 19:30 delayed by 30 mins due to shipping movements. Our services are currently suspended due to the adverse weather. East Cowes to Southampton Vehicle Ferry at 7:15 delayed by 20 mins due to operational reasons. Southampton to East Cowes Vehicle Ferry at 5:45 delayed by 40 mins due to operational reasons. The P-F (car ferry) has some scheduled sailings which are delayed by up to 30 minutes. The L-Y (car ferry) Due to the fog this morning sailings are delayed by around 40 minutes. West Cowes to Southampton Red Jet at 16:45 cancelled due to technical issue. We apologise for the inconvenience caused to your journey. Owing to a generator failure on board Red Jet 6, the 0845 and 0945 sailings from Southampton T2, along with the 0915 and 1015 sailings from West Cowes have been cancelled. Please be aware of potential delays and short notice cancellations throughout the day. West Cowes to Southampton Red Jet at 10:15 cancelled due to technical issue. We apologise for the inconvenience caused to your journey. Southampton to West Cowes Red Jet at 9:45 cancelled due to technical issue. We apologise for the inconvenience caused to your journey. Red Jet XX15 from Southampton and XX45 from Cowes delayed by 10 – 15 mins due to shipping movements. The P-F (car ferry) are delayed by 30 minutes because of fog, Portsmouth Harbour have enforced fog routine. Red Jet XX45 from Southampton and XX15 from Cowes delayed by 20-25 mins due to reduced visibility. We’re sorry but we’ve had to make some changes to our Portsmouth to Fishbourne Car Ferry timetable on Wednesday, 28 December. This is because of crew shortages. Customers booked on affected sailings have been contacted. Our Portsmouth – Fishbourne (car ferry service) some scheduled sailings are experiencing delays of up to 25 minutes, due to very low tides. Red Jet delayed by 15 mins due to reduced visibility. The P-F (car ferry) are delayed by 25 minutes due to fog routine implimented in Portsmouth Harbour. Red Jet XX15 from Southampton and XX45 from Cowes delayed by 15 mins due to reduced visibility. Red Jet 09:45 from Southampton and 10:15 from Cowes delayed by 15 mins due to waterjet obstruction. West Cowes to Southampton Red Jet at 11:15 cancelled due to waterjet obstruction. We apologise for the inconvenience caused to your journey.